The new Sparks Racing LTZ/KXF 400 exhaust system is awesome. The power gain over stock is tremendous. Acceleration is the biggest thing that you will notice on the Sparks exhaust over the competition. Peak power is solid and the midrange is lethal. The whole system weighs about 6.5 lbs., which is lighter than the stock system. The power gain is across the entire range. 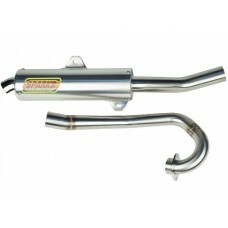 The aluminum silencer helps reduce weight, looks great and makes the LTZ/KXF sound like a true four-stroke performance machine. This exhaust can be found on Mike Walsh's Pro Production TT Championship LTZ 400 from the 2003 season as well as on the 2005 National winning machines of Shane Hitt and Harold Goodman. Also avaialable in Big Core for even more power. Call for recommendations.